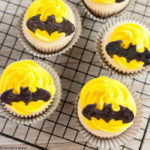 Need Batman Cupcakes perfect for a birthday party or movie night for Batman fans? Since the LEGO Batman movie was just released, I decided to come up with a Batman cupcake idea perfect for a movie night. Also on my mind was that last week, Adam West past away. He was the very first Batman that I watched growing up. I loved the show and this was another reason for coming up with this Batman cupcake idea. 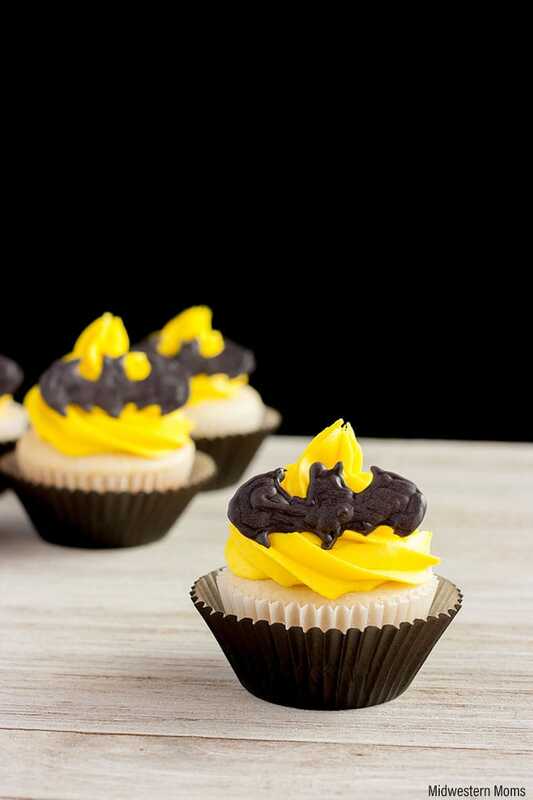 The concept for these cupcakes is derived from the Bat Signal. 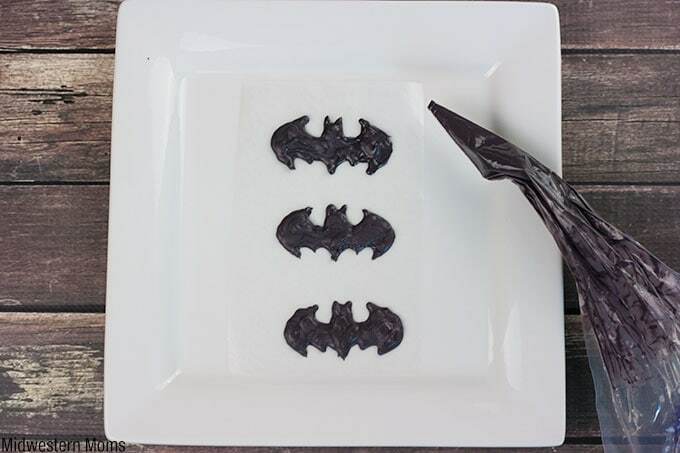 The yellow icing behind the bat symbolized the light created by the Bat Signal from Commissioner Gordon. The first step is to find a Bat Signal in the size you want for the cupcake topper. 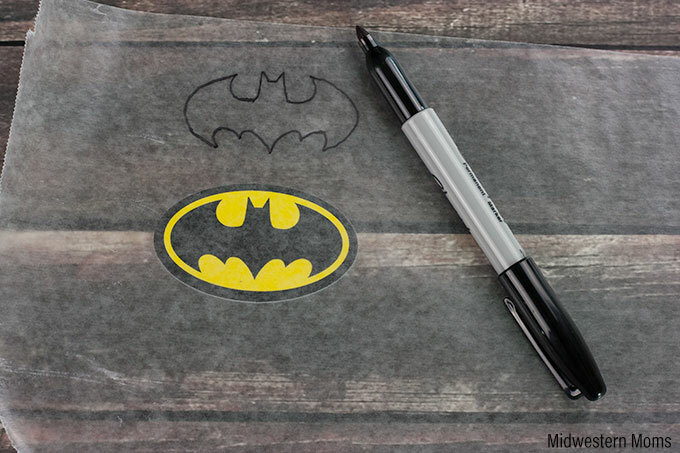 Then using a Sharpie, trace the bat part of the signal onto wax paper. Make as many as needed. Flip the wax paper over so the marker side is down. Melt Black Candy Melts according to the instructions. Place the melted candy in a disposable piping bag and snip the end. 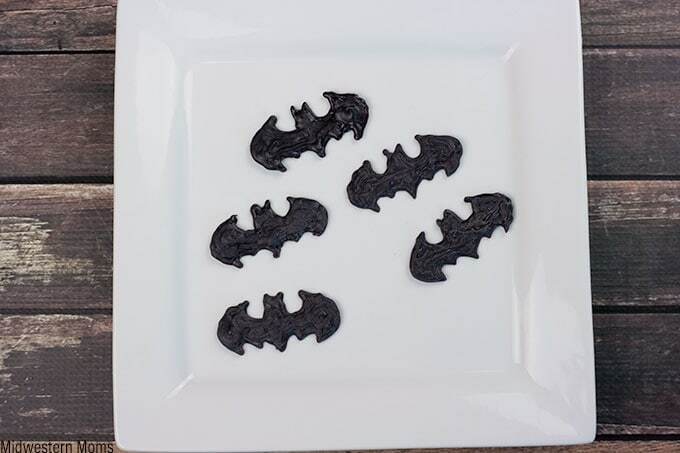 Pipe the candy onto the wax paper, tracing the outline of the bat. Then fill it in so it is solid. Place them in the fridge to harden for about 3o minutes. Take them out when it is time to ice the cupcakes. After piping the yellow icing on the cupcakes, place a bat on the side for decoration. 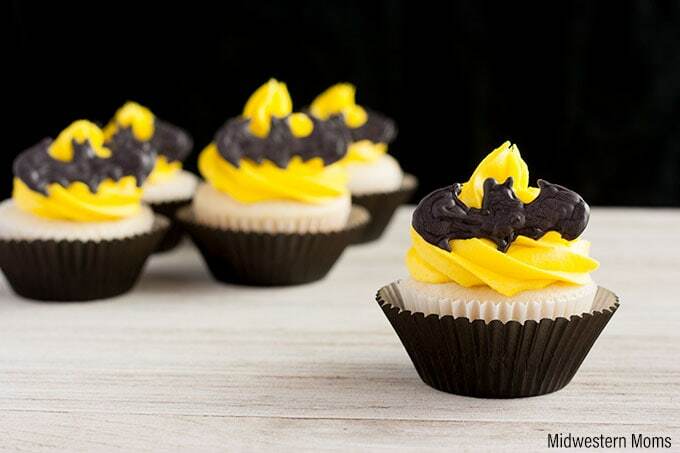 The perfect cupcakes for a Batman Fan! Use an ice cream scoop to help fill the cupcake liners. 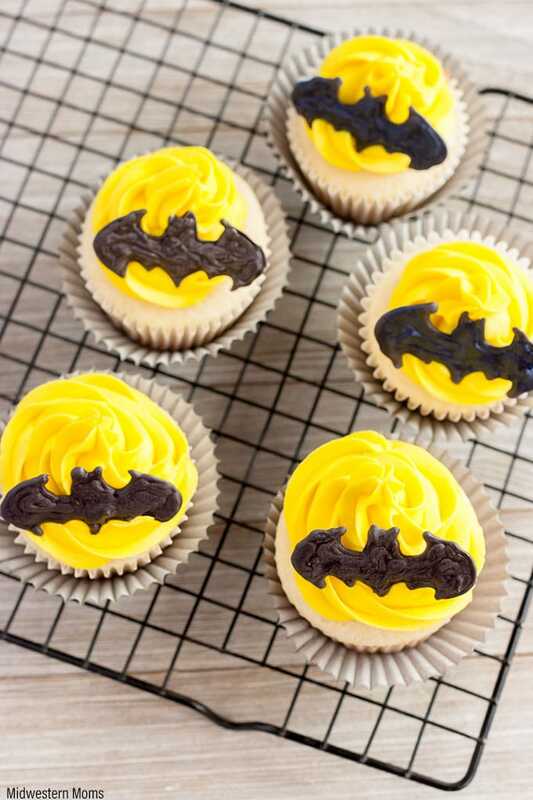 Perfect cupcakes for a Batman birthday party! In a large bowl mix cake mix, flour, sugar, salt, water, vegetable oil, vanilla extract, sour cream, and egg whites until well blended. Add cupcake liners to your cupcake tin. Scoop your cupcake batter into the prepared cupcake tin. Make sure not to get them more than 3/4 full. Bake at 325 degrees for about 18 minutes, or until a toothpick inserted into the cupcake comes out clean. Allow to cool before adding icing. Add Yellow coloring gel and mix until you get the desired color. See post for written instructions with photos. Add to cupcakes once they are iced. Cooking time does not reflect decorating time.